WHAT ARE THE LETTERING STYLES? WHAT IS THE BEST PAPER FOR LETTERING? 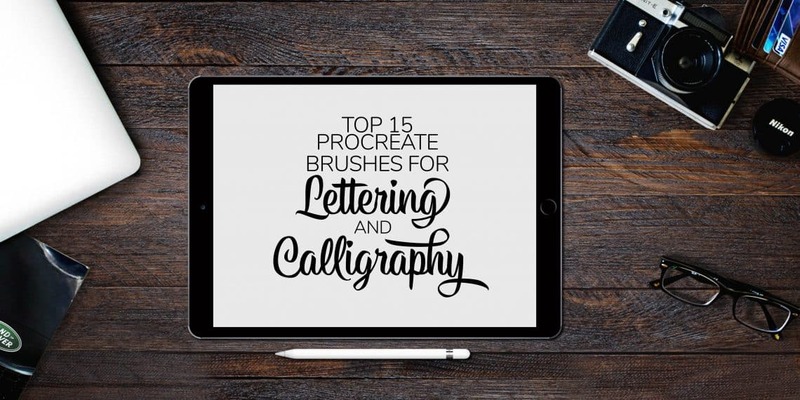 In this post we are reviewing some of the best Procreate brushes for hand lettering and calligraphy available on the market! iPad lettering has become a fast growing trend worldwide, and today there is a huge variety of different custom brushes available on the market. There are many different styles for both hand lettering and calligraphy, and we’ve decided to keep a mixed selection in order to offer something for everyone. So far we’ve tested and reviewed 15 different brush packs, however, with time we plan to update and grow this list. I just wanted to mention some of the things that we took in consideration for the brushes that are featured in this list. As mentioned in the very beginning of this post, we primarily wanted to compose a list that offers a wide variety of different brushes. We all have different preferences, and with these brushes you can really create any calligraphy and lettering style that you can imagine. Aside from that we also considered a variety of elements such as, quantity and quality of the brushes, the price, beginner friendliness, included extras, as well as other things that help to create a great brush pack that is suitable for all skill levels. This is the perfect brush pack for brush calligraphy! 12 unique, custom made brushes. The very first thing about these brushes that grabbed my attention was how easy it was to control each stroke. definitely a big plus right there! Another amazing feature of these brushes are the high quality textures. Each brush creates a different texture giving the user a wide variety of choice. Calligraphy DK really went one step beyond in order to capture the feel of a real brush pen. All in all the Procreate Lettering Brush Pack 3.0 is an amazing product for both beginners and more experienced calligraphers. If i could sum up this product with one word it would be – WOW!! This is probably one of the most value packed Procreate brush products that I’ve ever came across. Aside from containing a wide variety of different custom made brushes for both lettering and calligraphy, the main feature of this product is the 10 part workbook for beginners – that get’s loaded directly on Procreate. The 10 part workbook makes this product ideal for lettering beginners, as it teaches you everything you need to know from – terminology, basic strokes, constructing block letters, all the way to embellishments, color theory, layouts, prepping your work for print and further steps. This is great product for both beginners and more experienced artists, however, i believe that lettering beginners are going to benefit more from this product thanks to the 10 part workbook included. This bush set is great for modern calligraphy and expressive lettering . 20 high quality brushes with all different kind of textures. The product comes both as a brushset. file and individual brushes files. I personally love this feature as it makes it really easy to install on procreate. If you are more into modern calligraphy or you simply look for taking a break from traditional scripts, the Procreate Calligraphy Queen is definitely the brush pack for you. This is a great brush set for chalk lettering lovers! If you love chalk lettering but you don’t really have a place or the material to practice, this brush pack is the perfect alternative! The chalk texture with these brushes is just amazing. The brushes are created with very realistic textures and what makes this product even better, are all the bonus goods included! Along with clear instructions on how to install the chalk brush kit, you will also receive files containing tips & tricks, and inspiration for creating different styles – great for beginners! The Chalk Dust Brush Kit is a great product packed with a lot of different and interesting features that will definitely keep your practice routine busy and exciting! This is probably one of my personal favorites on this list! having that key feature of the spray can flare effect. The brushes share a similarity in their shape however they all have different textures giving a different look. I really enjoy working with these brushes, the settings are great by default and after constantly practicing the same, it’s really great to take a break and try something completely different. The Huge Cities Brush Pack is the smallest and most affordable item on our list. At an affordable price of only 5$. This brush pack is great for someone who enjoys practicing brush calligraphy on the iPad. A key feature of these brushes is that their default setting of the shape is set to ”Randomised”. What this essentially means is that every time you lift the pen the shape will change the direction and thus creating a different stroke and texture each time. at this point it all depends on your personal preferences. The Blackletter Dry Brushes for Procreate is simply AMAZING! The high quality textures, the default settings, all the extras – this pack is a goldmine for the wide nib calligraphy lovers. 16 uniquely textured dry brushes ranging from heavy saturation to light saturation on a variety of different surfaces. These brushes are also highly customizable. 2 unique splatter brushes. Made from real paint splatters, these highly-flexible brushes are great for adding texture and depth to your work. A pointed detail brush to assist in flourishes, filigrees, and other ornamental detail. A square grid brush to assist in compositional layout. The feature that really blew me away was the default settings of each brush. Pressure sensitivity making some strokes lighter and others darker, really creates an interesting effect. Another amazing feature is the azimuth setting, and what this basically does is that it changes the angle of your shape based on the angle of your Apple pen. Thanks to this setting you can really have a realistic calligraphy experience. I have to admit that at first it feels quite weird and it takes a bit of time to get used to it, but once you do, it feels weird to go back to the locked shape. Don’t worry, Jake included a PDF file that explains this whole thing along with instructions on how to install the brushes + a few extra tips. If you like broad edge scripts, there is absolutely no doubt that you will love this product! The 4th and latest edition of the DevBrush pack series is packed with value more than ever. Devan is a lettering artists highly focused on iPad lettering and his experience on Procreate definitely reflects on the quality of his latest brush pack! 3 Different sign painting brushes + a practice sheet for practicing capital casuals! All in all this is a great product that I really enjoyed working with. It offers a wide variety of completely different brushes that are great to combine together, and that will keep you busy for quite some time! The Brush Calligraphy Pack for Procreate is created specifically for brush calligraphy on the iPad. All of the brushes contain different high quality textures and specific grain sources in order to give you a wide selection choice. All of the setting have been fine tuned in order to create a smooth and enjoyable writing experience whether you are a total beginner or a more experienced calligrapher. Like with any other brush, you can adjust the setting to fit your style and preference. One of the most amazing things about Procreate and iPad lettering is the fact that you can create almost about everything! Watercolor is a popular art medium and it’s absolutely crazy how realistic your work can look with this brush pack. It took me a bit of trial and error before i started to get to know how the brushes work and especially how to blend the colors with the different blending modes. Kate made sure to include a big PDF file full of examples and helpful tips on how to get started which i found to be insanely helpful in the process. During our research process we stumbled upon several brush packs featuring the watercolor effect, but none of them had such huge amount of choice and such realistic features. If you like watercolors and working with Procreate, this is most definitely the brush pack for you! Are you maybe looking for a brush pack that contains everything you need for both hand lettering and calligraphy? The Procreate Lettering Toolkit by Quiver Supply contains a whopping 210 different brushes – say whaaat!? With this brush pack you can create an endless amount of different combinations and lettering styles. Along with the huge amount of different brushes, you will also receive the two lettering guides files (straight and slanted for calligraphy) which are really useful when it comes to keeping your work consistent. Another great feature are the collection of different shading, detail and decorating brushes, that will elevate the look of your work with ease. There is a big choice when it comes to brushes for calligraphy, however, the ones that really grabbed my attention were the copperplate brushes! I was really impressed by how well the settings were adjusted and along with the slanted guidelines (included in the brush pack), it really created a pleasant and smooth writing experience. To sum it up, the Procreate Lettering Toolkit is a great one stop have-it-all product that really offers a great value for the price. We have yet another amazing brush pack by the talented blackletter calligraphy artist Jake Rainis. 6 unique chiseled brushes at a variety of angles (0º, 10º, 45º, 90º, 135º, and 175º). Each one has a solid version and a pressurized, textured version. 6 unique grunge brushes to create muddled textures. 4 unique chiseled brushes for creating calligrams (each one has a solid version as well as a textured version). A circular calligram template to use in conjunction with the calligram brushes. A square grid brush to help lay out compositions. Jake is an experienced calligrapher specializing in broad edge nib scripts, and his knowledge and experience definitely reflects on the quality of his products. Something that i personally really like, is when a product is designed around the user. By this i mean that the product is designed in a manner that creates a very smooth and pleasurable experience – no matter if you are a complete beginner or a long time iPad user. Aside from a variety of different textured brushes, you will also get a bunch of educational extras as well! I think that this is a great starter kit for brush calligraphy beginner, and Ian made sure to create a very simple and fun experience. If you are a more experienced iPad user or calligrapher, i would perhaps recommend to check out some of the other brush pack that we mentioned so far. The DevBrush 3.0 for Procreate is an amazing brush pack that contains a whole variety of different brushes for both lettering and calligraphy. We liked the DevBrush 3.0 so much that a few months ago we already had the pleasure to collaborate with Devan and write a separate review post. The last product on our list is the Procreate Parallel Pen brush pack created by Calligraphy DK. The brushes are by default locked on a 45 degree angle, but you can easily flip the Azimuth setting on if you want the angle of the pen to change based on how you move the pen around. The brushes feature unique textures to create eye catching broad nib calligraphy. The first nine brushes are flat and locked brushes, meaning that they don’t change the size based on the pressure, however the other nine brushes have this exact feature enabled. At first i found them to be a bit difficult to manage, but then i realized that they are freaking great for details and flourishing! All in all, this is a great brush set with very intriguing textures and they are perfect for anyone who loves broad nib calligraphy scripts. There you have it gang, a very diverse list of some of the best procreate brushes available on the market. We wanted to keep the list diverse, so everyone can find something for themselves. We plan to keep expanding and updating this list with time, and if you have some suggestions or recommendations, you are always more than welcome to reach out! Are you struggling with lettering or calligraphy? is there an area in particular that you can’t seem to solve or improve? Are you perhaps looking for some constructive feedback or just a place to hang out with fellow lettering and calligraphy artists? If so, be sure to check out our official Facebook group! an exclusive content area with downloadable practice sheets, Procreate brushes, the 30 day lettering planner, printables and other freebies! Lettering Daily is an online community that provides educational and inspirational content on hand lettering and calligraphy. ​Our mission is to help artists and enthusiasts from all around the world to learn and improve their hand lettering and calligraphy skills. Lettering Daily is an online community that provides educational and inspirational content on hand lettering and calligraphy. Our mission is to help artists and enthusiasts from all around the world to learn and improve their hand lettering and calligraphy skills. We want to create a community where people can learn, grow, share and network together!